Both PURE and the PURE Group (the combination of PURE and PIC) have experienced steady growth in admitted assets year-over-year. Surplus contributions are included in a member’s cost of insurance for their first five years of membership. These funds, which equal a small percentage of a member’s premiums, provide a steady flow of capital to PURE, supporting its financial strength and creating a favorable cost of capital. This lower cost of capital contributes to PURE’s highly competitive rates. In 2017, surplus contributions reached $43,300,000. Policyholder surplus represents the capital that allows an insurer to meet all of its obligations beyond premiums, reserves and reinsurance. Last year, the PURE Group’s surplus grew by more than 33 percent to $416,600,000. In 2017, the PURE Group grew surplus at a faster rate than premiums, which lowered our premium to surplus ratio once again. PURE maintains a lower leverage ratio than most of the largest primarily personal lines insurers. 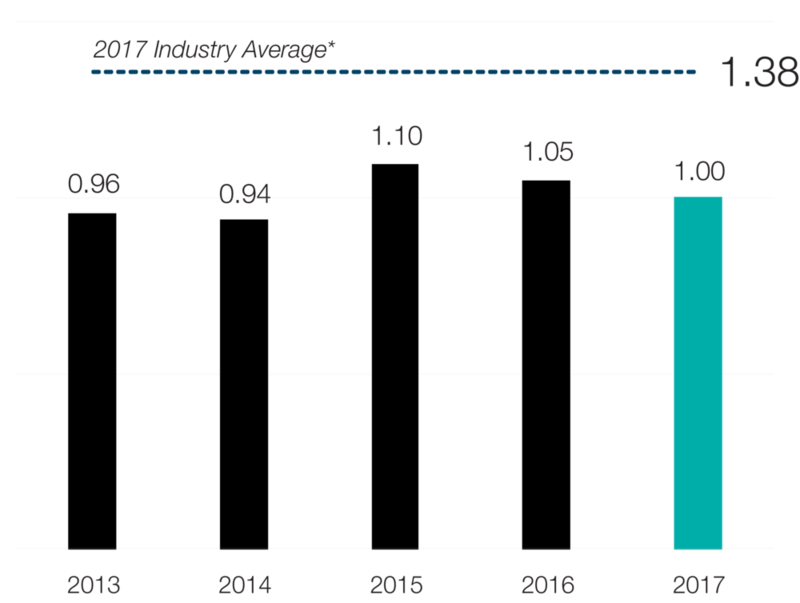 *2017 Industry Average is defined as the weighted average of net written premium to surplus ratio for the top ten U.S. Homeowners and Automobile carriers—defined as carriers with at least 80 percent of domestic writings in Homeowners and/or Personal Automobile lines. Investment returns play an important role in the economics of an insurance company, but an aggressive investment strategy can also create risk. PURE maintains a conservative investment portfolio composed primarily of short-duration, high-credit-quality, fixed-income holdings. These performed well in 2017. As a growing company, PURE is continually adding to its investment portfolio and grew its cash and invested assets by $46,000,000.